Service Costs > How Much Does iFly Cost? How Much Does iFly Cost? iFly, an entertainment company which allows you to skydive indoors, offers the dream of “flight” a reality by giving its customers “wings” in a safe environment, according to the official about us page. Started in 1998, the company has more than 37 locations in the world. The cost of iFly session, from our research, will depend on the package you buy as the more flights you purchase at once, the more you’re going to save. The location you choose as well can affect the price as well, with first-time flyer packages starting at $60 and five flight packages retailing for more than $150+ To know what the company charges at your local location, you can find out by visiting the official website, choosing your location, the number of flyers and then a package choice. These prices, however, can be much less if you were to find a coupon/promo code online, for instance, before registering for a flight. At the time of this publishing, for example, we found some locations advertising flights on Groupon.com. NOTE: These are just averages sourced from most of the locations we looked at online. Again, we encourage you to go to the official website to know what you will pay for a flight at your local iFly location. 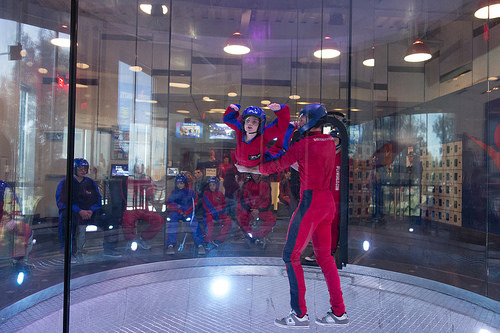 Photos/Video: iFly, from what it appears on the website, does take pictures and videos, which can then be purchased after the flight completes if you choose to do so. This is entirely optional, but a fee people often overlook. High Flight Option: The high flight option allows you to fly higher and faster than they would fly on their own for about 15 to 20 seconds at the end of the final flight. This is said to be about an additional $10 or so. The entire experience, according to the company, is about 90 to 120 minutes, from start to finish, with each “flight” equivalent to 1.5 skydives on average. Before your flight, the company asks that you show up at least 15 minutes early to complete a flight waiver if you haven’t already done so as well as check in with the staff. To save time, you can sign a flight waiver online. At this time, the staff will help put on your wristband and assist you to the Flight Deck, where you will be able to watch other flyers before you meet your instructor. Once it’s time to fly, you will be greeted by your instructor who is trained and certified by the International Bodyflight Association, referred to as the IBA. At this time, he or she will answer any questions you may have about the experience and help train you about the proper body positioning and hand signals to use during the flight. When you feel comfortable with training, you will then be led to the “Gear Up” counter, where you will receive your helmet, flight suit and goggles to wear during your jump. At this time, you can then fly while your instructor leads you to the chamber to assist you with entering, flying and exiting. These are all of the locations as of 2018 in the United States and are subject to change. Refer to the official website for up-to-date location details. If you feel you like the experience and want to continue to jump, then you can advance your flight skills through the varying training levels, all while building your skills. Any flyers who weigh between 260 and 300 pounds must bring this to the company’s attention as additional restrictions and instructor schedulings may apply. As per the FAQ, all participants must weigh less than 300 pounds, can’t be pregnant and should not have any back, neck or heart problems as of late. Talk with your doctor before flying to see if it’s best for you. Flyers can be as young as three years old, with no upper age limit. The dress code recommended by the company includes wearing well-fitted, lace-up sneakers or running shoes as well as casual clothes, preferably pants and a non-collar shirt.